Kitchens are frequently a central place within people’s homes, but kitchen remodeling is often something that people put off for years. However, there are certain signs you should look for that may indicate to you that your kitchen is in desperate need of a remodel. Whether you’re hosting your friends, family or simply eating a meal on your own, you want your kitchen to be an inviting place in which to spend time. If you find that the idea of even going into your kitchen stresses you, there are probably issues that need to be addressed in your kitchen. Taking the time to identify these issues can help put you on the path to renovating your kitchen. When you’re cooking or baking, you want to know that you can count on your appliances to consistently work. Working with appliances that are broken or don’t always work as they should can cause you to waste food, become stressed and waste money. Sometimes appliances can be fixed, but If it seems as if all your appliances are breaking at once, a remodel which includes new, dependable appliances can make a drastic difference in your home. If you find yourself embarrassed to host anyone in your kitchen or feel as if the layout of your kitchen is preventing you from working efficiently, the problem is likely your kitchen. You can focus on fixing different aspects of your kitchen in the renovating process in order to create a functional and aesthetically pleasing space. 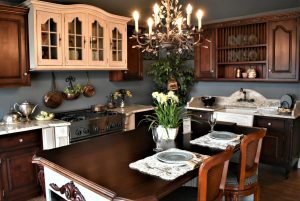 Kitchen remodeling can make working in your kitchen a breeze and can make spending time there an enjoyable experience. Kitchen remodeling can change the entire appearance of a home’s interior. As you remodel your kitchen, make sure you’re working with a skilled contractor who will help you manage the details of your renovation.